• Finish: All rigs are zinc plated to resist corrosion and rust. 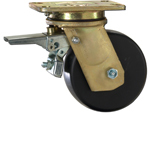 • Notched Yoke Base: Notched to accommodate swivel lock. ﻿Load Capacity	Up to 1600 lbs. ﻿﻿Load Capacity Up to 1500 lbs. 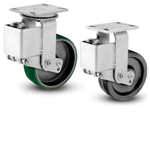 ﻿• 4-Sided Double Ball Bearing Raceway: Hardened steel ball bearings in the main load bearing and secondary thrust bearings touch the swivel raceway “on all four sides.” This protects the central king pin from shock loading for free swiveling under heavy loads. 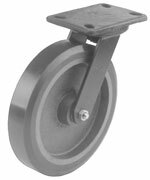 • Raceway Dust Cap: Dust caps protect the raceway from contamination by dust, dirt, moisture, and other debris. ﻿﻿Load Capacity Up to 1800 lbs. ﻿• Hot Forged Steel Raceway: SAE-1050 hot forged steel assembly with acutely formed and matched raceways that contain a full complement of 3/8" diameter polished alloy steel ball bearings. 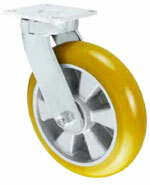 Secondary raceway uses tapered roller bearing for added endurance. • Adjustable Kingpin: Special 3/4" diameter integral forged king pin bolt and nut is fully adjustable whenever necessary. • Lubrication Fittings: Easily accessible pressure fitting is added to main and secondary ball race, and to wheel bearings through either a fitting in the head of axle. • Reinforced Welded Fork Legs: Side forks are extra-wide, offset, and continuously welded for added strength. 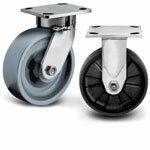 ﻿Extra heavy duty kingpinless caster construction with offset raceway for additional strength. Proudly Made in the USA! Raceway Design: 2-3/4" diameter with 1/2" carbon steel balls. Load and thrust are accommodated by our patented Kingpinless™ design. Precision machined; hardened to 53 Rockwell C. minimum. 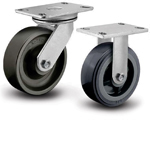 Wheels: 2" wide wheels are equipped with either 3/4" roller bearing which rotates on a 3/4" hardened and ground spanner, annular bearing, or a delrin/plain wheel bearing. 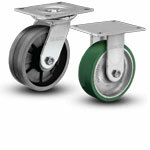 2-1/2" and 3" wide wheels are equipped with either a 1" I.D. straight roller bearing which rotates on a spanner bushing, 3/4" I.D. 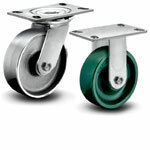 tapered bearings that rotate on the axle, or precision ball bearings. Bolt Hole Spacing: 2-7/16" x 4-15/16", slotted to 3- 3/8" x 5-1/4"
• Fork Leg Spacing: 2-7/16"
﻿• Raceway: SS Double Ball Raceway formed smooth for easy swivel action w/ stainless steel balls. Type 304 Stainless Steel. 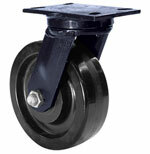 • Zerk Fitting: in the swivel section and head of the axle bolt. • Axle & Lock Nut: 1/2” w & w/o stainless steel zerk. • Note: Zerk not necessary w/ Precision Ball Bearing wheels. • Top Plate: 4-1/2" x 6-1/4"
Heavier duty with improved features: a high-capacity 3/4” nut & bolt kingpin, larger upper and lower ball raceways featuring 3/8” and 5/16” diameter ball bearings respectively, a larger (4-1/2” x 6-1/4”) industry standard top plate, and reinforced legs on both swivels and rigids. 100% stainless steel. 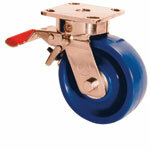 This product is ideal for those applications where a higher capacity stainless caster is required. 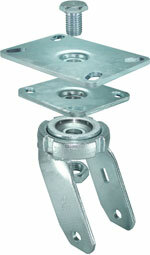 • Raceway Design: Kingpinless single ball bearing precision machined raceway. 2-3/8" diameter raceway with 3/8" stainless ball bearings. • Mounting Bolt Diameter: 3/8"